A podcast about all things Macintosh. For Mac geeks, by Mac geeks. Show 201. iPhone 1.1.1 update released. Shooby’s bricked iPhone. iPod Touch 1.1.1 update. Updates for iLife, iPhoto, iMovie, iTunes (Win), iWork, iWeb and Apple’s store web site. Firmware updates for iMac, Mac Pro, MacBook and Xserve. Target sells pink Shuffle iPhone absent at Apple Expo. Listener comments web screen capture app. Rumors of an Appe PDA surfacing. Feedback on using exchange server with iPhone. Blocking IntelliTXT ads. Drawing tablets for the Mac. Gadget Locker, Get up to 20% off select items. It’s finally here and I am downloading it now. For sure I will be covering the new features and updates on the next show. 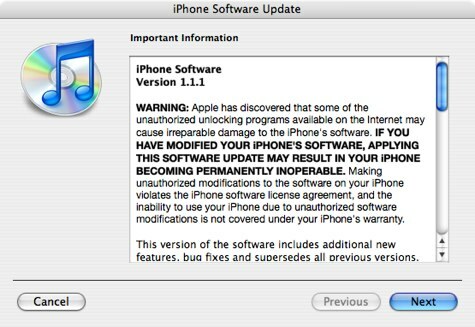 One thing that was made VERY clear from the installer was Apple’s stern warning to iPhone un-lockers that the update would potentially permanently damage their iPhone (see below). So re-lock your iPhone or don’t do the update. Update: Looks like there are some challenges for iPhone hacks even if they re-lock the iPhone prior to running the update. I just spoke with Shooby and he used the currently published re-locking procedures to relock and restore his iPhone. He reinserted his AT&T SIM and ran the 1.1.1 update. After update his AT&T SIM was invalidated. Now, we are not sure if the error is with the procedure he used to re-lock the phone or if this will be the experience for everyone, but at the very least it should server as a BIG warning. If you have a SIM unlocked iPhone, please wait for the iPhone Dev team to look into this before running the 1.1.1 update. Shooby is working with them now, so stay tuned. One of my previous posts pre-iPhone, I wrote about how there were ways to work around the iPhone’s limitations, and how you could use email to send your photos to Flickr. Well now, thanks to some hacker/tinkerers, we have a 3rd party native iPhone app that does the job splendidly! The app is called iFlickr. It can be installed via the Installer.app hack which is really the only (read: easiest) way to install 3rd party apps on your phone. New and improved applications are finding their way to the iPhone every day—from an old-school NES game player to IM applications, a webserver, one-off iPhone-unique games like Lights Off and Tap Tap Revolution, all among many others. No, they’re not all perfect, some in alpha or beta in quality, but these apps are diverse in function and imaginative. Having recently purchased in an Xbox 360 I was disappointed to find out there was no native support for streaming content to your 360 from your Mac. One of the major selling points of the 360 is its ability to act as a media center, even allowing Mac formated iPods to connect via USB. Windows users can stream a wide array of media to their 360, but Mac users have been left out. This is where Nullriver Software comes in with Connect360. The concept behind their software is to allow all of your iLife content to be streamed directly to the 360, and it works as simply as it sounds. Requiring minimal setup and only $20 USD for the full version, Connect360 is a must have for Mac and 360 owners. The only notable downsides are not the fault of Nullriver, but of DRM and Microsoft’s limited codec support. A podcast about all things Macintosh. For Mac geeks, by Mac geeks. Special episode to announce the recipients of the Maccast 200 gifts. 200th show gift giveaway on Monday. I’ll be at Podcast Expo next week. Come by and say Hi! Superheroes of Podcasting coloring contest at the show. Apple next on the EC’s radar? Microsoft, on Monday lost it’s three year long appeal case (full extremely long document can be read here) against the EU anti-trust order which was imposed in 2004. The order will make the enormous fish pay a record fine of $613 Million, sell a version of Windows which does not include its media player, and force them to share code relevant for allowing devices of different operating systems to communicate with Windows devices. This is a landmark case for the European Commission (EC) who seems to be actively pursuing large US companies with large market share in their respective fields, and it appears that Apple is next on the EC’s radar. Apple and some of its music partners are currently facing investigation by the European anti-trust officials for the pricing of items in the iTunes store. The commission wants to discover the reasons for different pricing in different territories of the European Union (for people who aren’t in Europe, you can only purchase from the country which your credit/debit card address is located. Apple also has different prices in the different stores). This is no joke for Apple as the EC has power to fine a company up to 10% of there worldwide revenue. If you recently upgraded to iLife 08, no doubt you’ve noticed some rather dramatic changes in how the updated applications look and work. One particular change to iPhoto is starting to annoy digital photographers used to diving into the iPhoto Library folder to directly access images imported into iPhoto. The new iLife 08 version of iPhoto’s Library is no longer a standard folder, but is instead a package. This new format prevents users from easily viewing and opening images in the iPhoto Library in the Finder or applications like Adobe Photoshop. But there is a simple solution. Well, Apple did NOT announce the arrival of the Beatles on iTunes today like I thought and I have never been happier to be wrong. As most other rumor sites predicted, Apple did officially announce the date for the UK launch of the iPhone. November 9th the iPhone will go on sale in the UK and as predicted O2 will be the exclusive carrier of the “Jesus” phone. “We’re thrilled to be partnering with O2 to offer our revolutionary iPhone to UK customers”, said Steve Jobs, Apple’s CEO. “US iPhone customer satisfaction is off the charts, and we can’t wait to let UK customers get their hands on it and learn what they think of it”. Apple held a special event at the Regent Street Apple store Tuesday morning to announce the deal. At the event Apple and O2 also gave details on pricing and service plans. The iPhone will be available in an 8GB model for £269 (inc VAT) (USD ~ $536). For service, customers can pick from three monthly iPhone “tariffs” offered by O2. £35 (USD ~$70) for 200 minutes, £45 (USD ~$90) for 600 minutes, and £55 (USD ~$110) for 1200 minutes. The 200 minute plan includes 200 SMS messages, while the upper two plans come with 500 SMS messages a month. All plans come with unlimited data, visual voicemail, and access to 7,500 wifi hotspots from The Cloud. A podcast about all things Macintosh. For Mac geeks, by Mac geeks. Show 199. Apple updates Quicktime and keyboard software, Apple releases Logic Studio, iPhone unlocking continues, iPod Touch available now, Secretive Apple UK Press event. I am a new iPhone owner. Creating Ringtones for free. iPod Touch vs. iPhone. “I have something to sayâ€¦” Apple EU perspective. Recovering Finder sidebar icons. Photobooth mini review. Dock organiztion and tricks. Simple audio recording and iPod syncing question. 200th show coming and I’m giving gifts. Maccast coloring book giveaway at Podcast Expo. New music, Yeah Yeah Yeah by Once Just [ iTunes ]. Circus Ponies NoteBook, your your free 30-day trial. The Gadget Locker, pick up a new iPod case today!